Small tin particle arrays show a component of conductivity above the critical temperature that can be described by an Aslamasov-Larkin-type fluctuation-induced conductivity term Δσ0 in the zero-dimensional limit. A simple model is introduced to unfold experimental results for Δσ0 from experimental data. Those results show that it is proportional to l/(T−T c )2 over a broad temperature range, in agreement with theoretical predictions. Its absolute magnitude is difficult to measure precisely, but our estimate for it is of the same order of magnitude as the theoretical prediction. 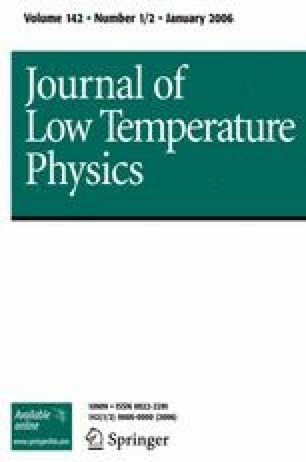 Other order-of-magnitude estimates show that Josephson coupling, thermal noise, and Maki term effects can be neglected forT−T c >20 mK. Research supported by National Science Foundation Grant GH-37239. On leave from Department of Physics and Astronomy, Tel Aviv University, Tel Aviv, Israel. Research supported by the U.S. Army Research Office, Durham, North Carolina.